I bought a ReplayTV DVR in late 2003. At that time, there were two devices in the space, TiVo and ReplayTV. Replay was owned by a company called Sonic Blue (they also made MP3 players). At the time there were two ways to activate the device. You could pay for a lifetime subscription of $199 or you could pay a monthly fee of $10. The rub was that the lifetime subscription was per-device, so if anything ever happened to the device you’d have to pay the $199 again. It’s interesting that mail applications tend to treat junk mail as a binary classification. Either a message is spam or it’s not. In my life I would say that there is a gray area of… “junky” mail. You know the kind of thing, the constant influx of emails from all those retailers that you’ve ordered from before, or newsletters that you’ve signed up for. For the longest time, I’ve just marked junky mail as junk mail and it’s all gone away. The issue is that it’s not really junk mail, every so often there’s a nugget of value there. It really isn’t the same as the constant influx of offers to sell me a watch (or make my p3n1s bigger). The problem is that there isn’t a convenient way to manage this junky mail. 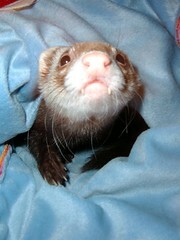 Tonight we put Nigel (the ferret) to sleep. Nigel was never the healthiest of animals, it was the reason we ended up adopting him in the first place. His life was three times longer than it would have been if Cara hadn’t adopted him. Even so, he spent the last few years bouncing between good heath and bad. We almost made this decision months ago, but it didn’t feel right at the time. We were glad we didn’t do it then. The time wasn’t right, and he bounced back for a few months. Unfortunately the last few weeks he began a spiral again, and this time we were out of good ideas. We could have tried a few more things, that may have made life somewhat better for a while, but he would have still been sick. In the end we decided that it wasn’t worth extending his life if he wasn’t going to be able to be a happy ferret. This wasn’t a decision that we made lightly, and regardless of our intentions to do the right thing, it doesn’t mean that this decision is guilt free. A lot of that guilt comes from the fact that ferrets need a lot more companionship than we have been able to offer Nigel over the last three years, we only hope that three years with us was better than the alternative of no years at all. He was mostly a good pet, and we wish him well on his travels.